I am in a department store looking at a sweater I like, but I also see a cream colored navy blue pin-striped suit that I love, too. I walk further into the store and it becomes the Museum of Modern Art. 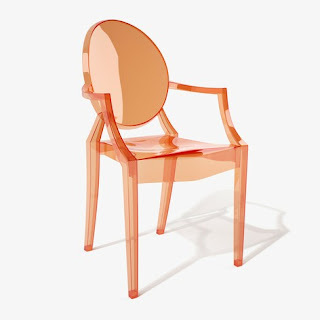 I am looking for a Philippe Starck Louis Ghost Chair in orange for my current interior design clients, exactly like I am in outer life. I think that I will buy one to show them, and if they do not like it, I will keep it because the Louis Ghost chair is just cool.